Samsung's Smartphone GamePad is now available in Europe. 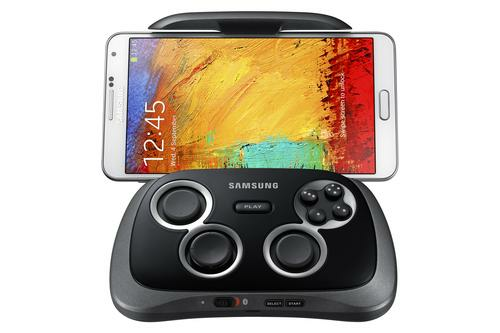 Samsung Electronics will ship 35 games with its Smartphone GamePad gaming controller, which can be attached to most of its Android-based Galaxy smartphones. Samsung pitches the Smartphone GamePad as an alternative to portable consoles like Sony's PS Vita or Nintendo's 3DS. It has a directional pad, two analog sticks, four action buttons and two trigger buttons. Android games have to be customized to work with the controller. The first batch of compatible titles includes "Need for Speed Most Wanted", "Asphalt 8: Airborne", "Modern Combat 4: Zero Hour", "Virtua Tennis Challenge", and "Prince of Persia: The Shadow and the Flame", Samsung said. The controller has been optimized for Samsung's own Galaxy devices running Android 4.3 or newer. Owners of products including the Galaxy Note 3, S4, Note II, and S III can connect using an NFC tag by clicking on a button labelled "Play" on the controller. The device can also connect to Samsung devices running Android 4.1 using Bluetooth, but in this case the "Play" button won't work. To get started users first have to download Samsung's Mobile Console app from the company's Apps store, or click on the "Play" button if they have a compatible device. Users can also connect their GamePad-equipped Galaxy smartphone to a TV using an HDMI cable or AllShare screen mirroring. The controller measures approximately 138 x 86 x 32 millimeters and weighs 195 grams. That means a Galaxy S4 with its 5-inch screen plus the controller weighs about 325 grams. That compares to the Sony PS Vita which weighs about 279 grams with 3G and Wi-Fi. It too has a 5-inch screen. Samsung said the GamePad is currently available in select European countries and will be available in additional countries in the coming weeks. However, finding a site where it was on sale on Tuesday was difficult. Via online retailers such as UK site Mobilefun, the controller was only available for pre-order. The site priced it at £89.95 (US$147) including VAT. In Sweden, the GamePad will go on sale in two to three weeks and cost 900 Swedish kronor (US$137) including VAT, a Samsung spokesman said.